Prying the lid off of vacuum sealed Christianity proves difficult at best. Rollins, unlike most who write about the state of the Christian ‘union’, seems to be the most adept at this task. Rather than attempting to be nice about it or by thinking only from within the parameters of the religion, the author – even as a Christian – has an ability and the will to step outside of his faith in order to honestly examine his faith. The result is, as usual, breathtakingly refreshing and resonates with the soul. He is able to articulately bring to discussion the angst that often resides just below the surface in the minds of many contemporary Christians. 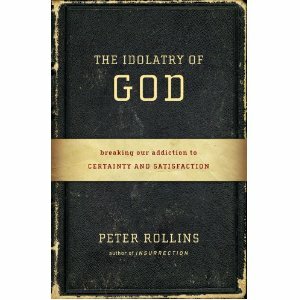 We are, as Peter pens, addicted to our religion. But what, exactly does that mean? Why have we turned God into an idol? Why do we keep doing, with pleasure, the very things that keep us from God? This really is a much needed book. For each returning vet suffering from PTSD there are family and friends of that vet who need to better understand what is going on. The author, who is not only the spouse of a vet with PTSD, but also one who suffers with PTSD from her own earlier trauma, presents her experiences and her research in this book. It is important to remember that research continues in the field of post trauma stress. Erica Davis presents what she has found to be useful in both understanding and in needed skills for those married to a spouse with PTSD. Davis gives a brief overview of what is known about this disorder and what treatment options are available. Most importantly, becoming aware of how a spouse suffering with PTSD may influence you, the spouse, is essential. The author lived for years without understanding what was going on with her husband and subsequently with herself. Are you married to a vet, are yourself a vet, and/or have you or someone you live with been through a traumatic experience other than at war? If so, don’t miss this opportunity to educate yourself on this topic. What you will learn may save your relationship, your sanity, and possibly even your life. Frankly, I’m not sure what to do with this book. I am, like the author, no big fan of religion. I think the church has effectively added to the crucifixion of Jesus a crucifixion of every good thing he ever taught. What disappointed me in this book was the the author moved the discussion in the opposite direction than I have gone. I felt he took me from the insanity of religion into the inane. The little bit of ancient Enoch reference was creatively re-imagined. I don’t understand how this could be sacred, when even the definition of the word ‘sacred’ was itself abandoned. This book was truly more artful than an ‘art’ for knowing God. Having said that, if this approach really worked for the author and works for others – wonderful. It just missed the mark for me. Despite the fact that the book didn’t even grab my attention in the introduction, I persisted in reading, curious as to how the author would develop his thinking, hoping something better would soon emerge. Occasionally he would make a statement that rather resonated with me. I then read on hoping for a little deeper exploration of his comment. But it just wasn’t there, time after time. Similarly, various chapter headings caught my attention, but the contents fell short on delivering the ‘goods’ – often seeming irrelevant to the headings. Sorry, but for me, this was merely Tolle retold rather than the Old Story pleasantly redeemed and retold.